SJ Wolfe Racing's star juvenile Lordhelpmerun claimed a thrilling victory in yesterday's Group 3 $200,000 WA Sires' Produce Stakes (1400m) at Ascot today. After a daring ride by stable jockey Shaun McGruddy, the son of Playing God loomed large in the three-wide line to take the lead on straightening, booting clear and cling on gamely late to defeat race favourite Lady Cosmology by a half head. 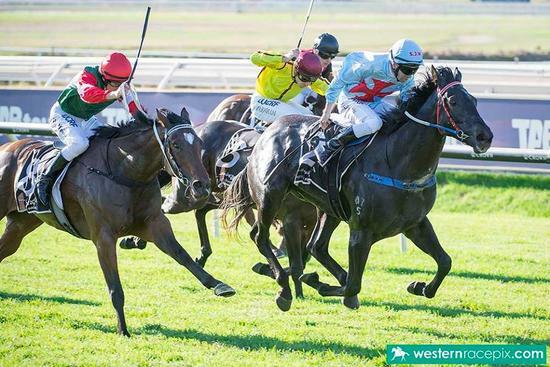 Lordhelpmerun, who finished a brave third in the Group 2 $500,000 Karrakatta Plate (1200m) two weeks ago, turned the tables to claim one of Western Australia's two-year-old 'majors' and confirm his position among the very best of his division. The former $25,000 yearling purchase ends his two-year-old season with two wins and two placings from four starts, and $262,800 in earnings. He will head to the paddock and is likely to embark on a WA Guineas campaign as a spring three-year-old.